Amazon’s Echo Show is about to launch, the new Echo Look seems intriguing, and the Echo Dot makes it easier than ever to put Alexa everywhere in your home. 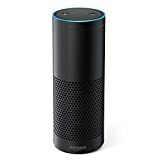 But there’s still only one device that can be called the best Amazon smart speaker on the planet, and it’s the original Amazon Echo. It features the best-quality sound and mics at a very fair price point, but that price point is still a bit difficult for some people to swallow. Lucky for them, there’s still time to score a refurbished Amazon Echo at its lowest price of 2017 so far.